Eclipse RCP provides an easy way to create desktop applications with industry standards. Once you understand how the framework works, it’s very straightforward to add more views, perspectives, etc. This article shows how to create a simple rich client application with a view by using development wizard. It also explains the role of each file created. I assume you already have PDE installed. If you don't, you can quickly find out how to do that from the "How to install PDE" tutorial. The following 4 pictures show the 4 steps for creating a simple app with wizard. The template used is "RCP Application with a View". 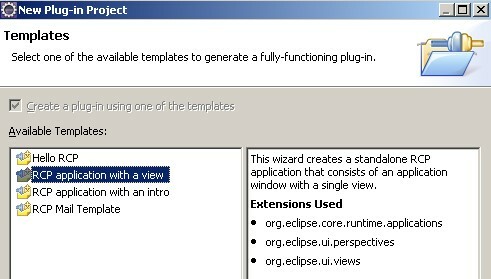 Here is the files created automatically by Eclipse. Eclipse RCP provides the concept of "extension points" and "extensions" to facilitate commercial desktop application development. It provides a way to use the whole framework easily through plugin.xml file which is under root directory of each directory. During the startup of an Eclipse RCP application, the Eclipse runtime detects main entry point class through extension point defined in plugin.xml. 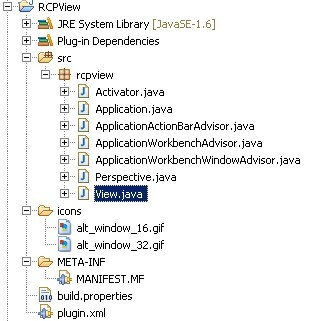 The class implements IApplication interface, and is loaded first like the main function in a general Java application. Application class creates and runs a Workbench. The Workbench builds on top of the Runtime, SWT and JFace to provide a highly scalable, open-ended, multi-window environment for managing views, editors, perspectives (task-oriented layouts), actions, wizards, preference pages, and more. 1. The initial perspective to be shown. 2. which WorkbenchWindowAdvisor to use. The workbench starts WorkbenchWindow which is configured via WorkbenchWindowAdvisor. //preWindowOpen method configure the initial window size and positions. On a typical appliation, when you start it, there is a window shown up. Perspective is like a page in a book, while the book is the window. A perspective is a container for visual elements like views, editors, and actions. Each perspective may contain 0 or several views depending on the design. A view is a workbench part to perform a visual task, such as navigating a tree directory, editing an email, etc. It provide a better way to organize visual components based on their functions or purposes. Click Eclipse RCP Development Tutorials to see more advanced topics.